As part of an effort to make our fireplaces safer, Flare Fireplaces is offering our full line of products with double glass technology. In this design, air cools the external glass with the help of built-in blowers, significantly reducing it to a temperature that it is safe for a brief touch. The fireplace efficiency and heating characteristics are maintained with a sleek, external look, free of any protective screen. The Flare Double Glass fireplaces do not require power venting, keeping installation simple and cost low. 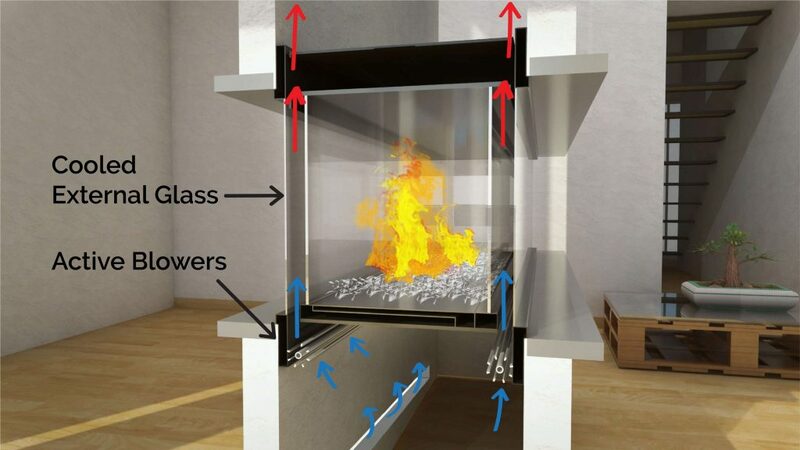 Double Glass heat barrier feature does not change the size or framing requirement for the fireplace. Quiet and efficient, the Flare modern and frameless double glass solution is perfect for commercial application that require the safety feature.